Here’s what I’ve got for all you pretty ladies, the 8 Must Have Indian ethnic wear in the most comfortable and stylised clothing category none other than the salwar kameez. 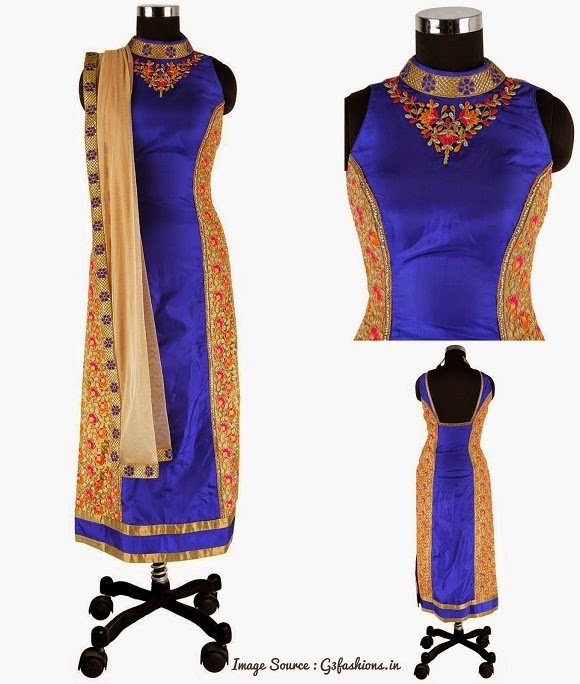 We all have our favourite kind of salwar kameez style, not to mention that they are found in many and many more styles and just keep reviving and changing. The current fashion for India suggesting the 8 new styles of salwar kameezfrom inspiring designer collections to the pret e porter category. These ones are the best and must haves for all women who need to accentuate their Indian style of dressing from casual to occasional wear. 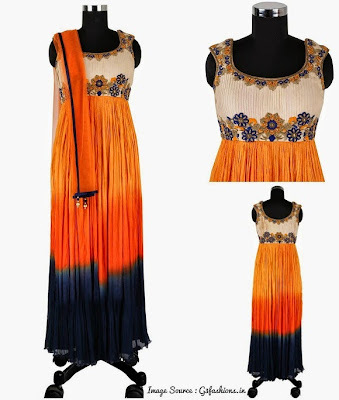 This one’s got in fashion from the designers like Payal Singhal, Manish Malhotra and others who made this one work with a very modern style blend. The kameez has a centre opening from beneath the waist line and kalis attached from the sides of the waist, paired with pants or palazzos. Wearing this to a party or Wedding ceremony will wow your Indian image. A new look of drapes on salwar kameez, these have drapes in cowls and flared fabric pre-stitched to give that perfect look on the kameez. They are themed out very well, designers like RidhiMehra, TarunTahiliani, have done wonders to such salwar suits for high profile parties and events to weddings. These were a part of Sufism clothing and now reviving this style with contemporary styles making it one of the most sophisticated wedding salwar suit and comfortable. 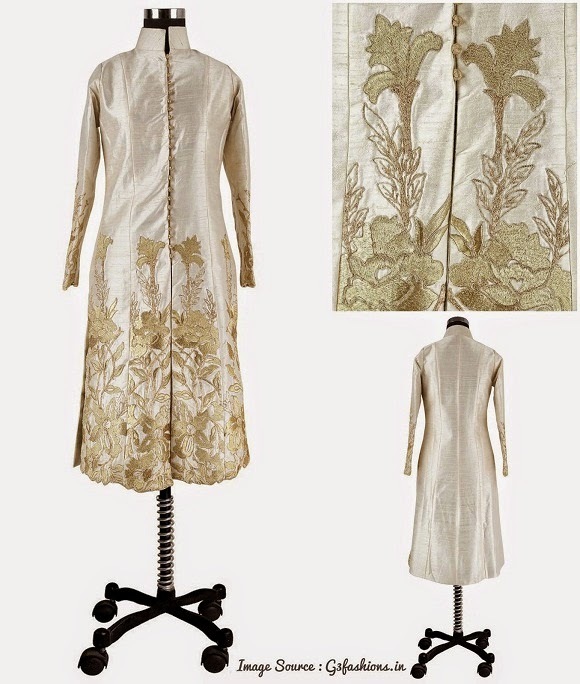 VikramPhadnis, Manish Malhotra, Anamika Khanna have got the ancient fashions trending back again. What’s something that looks totally perky and traditional? 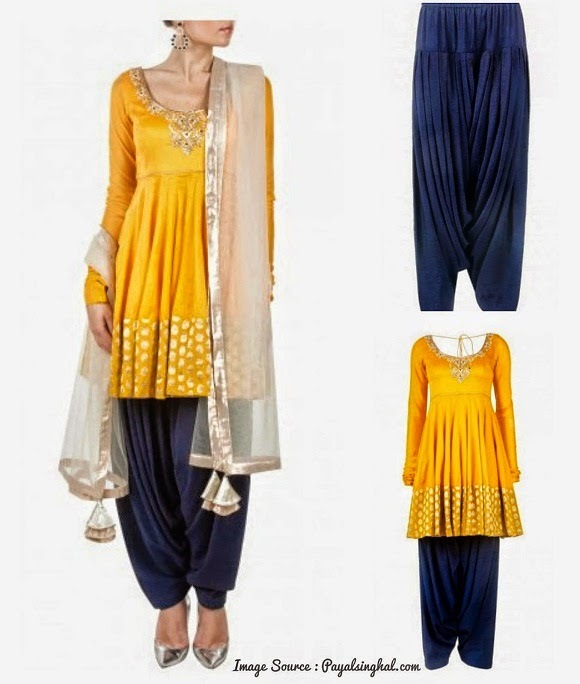 Well this one has become very fashionable and has been revived from the traditional Punjabi Patiala salwar kameez. 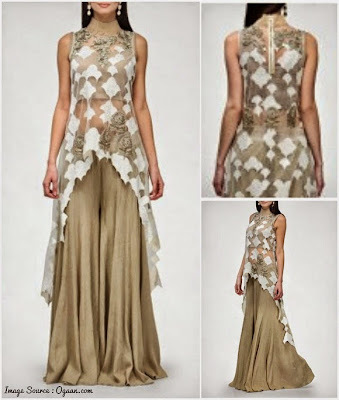 Designer PayalSinghal has made this design paired up with a dhoti Patiala and a short length anarkalikameez. 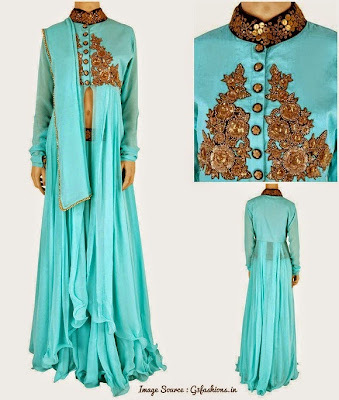 This is a very stylish salwarkameez. Get the latest designs by Payal Singhal Here. 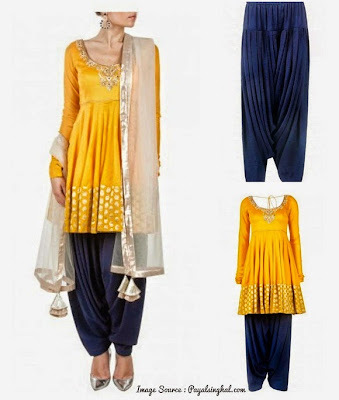 A complete style of western fashion just that they trend and have minimal styling of the basic salwar kameez. Centre line opening from the waist line or top neck or may have no opening but worn like a poncho paired up with pants and palazzos. Designers like Nikhil Thampi, Masaba, Payal Singhal, and find these western salwar kameez style son Ogaan.com. A version of the Pakistani salwar suits but just more creative with the fitting shape kameez and paired up with pants or palazzos as well. 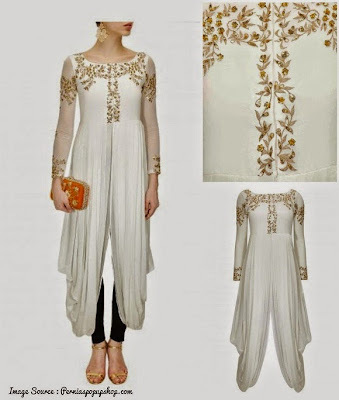 The straight cut salwar kameez in longer length are a must have and found trending in younger generation. This was inspired from the 70’s fashion of Indian fashion industry where we saw the Bollywood divas like Asha Parekh, Sharmila Tagore flaunt straight cut salwar kameez which were till knee length back then. 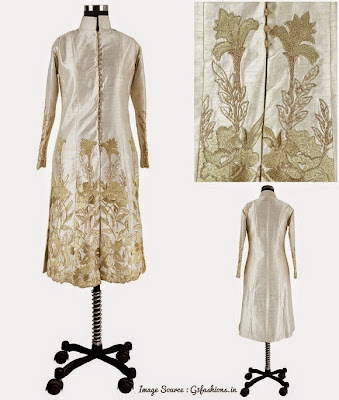 Designers favourite piece of Indian outfit, making it look different every season, blending some ancient techniques to some flawless new drapes and western cuts. 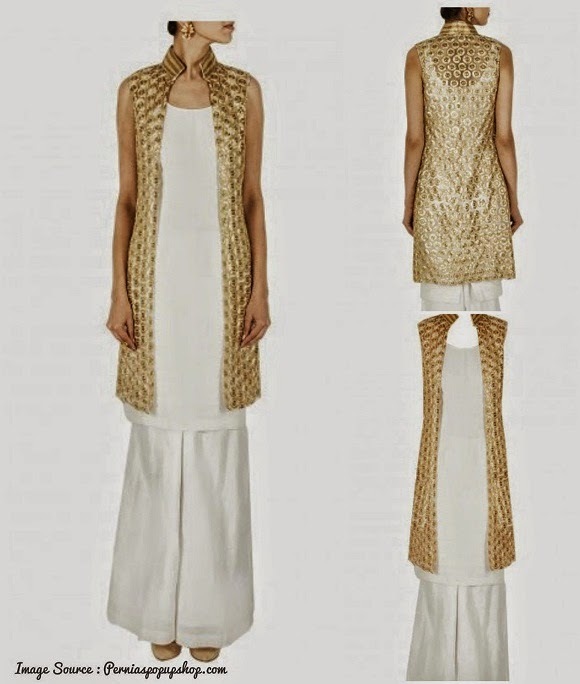 Salwar suits are very common and also at the same time an Haute Couture of Indian fashion which somehow has an impact on International fashion as well.